Spring is in full swing and so many fabulous vegetables are in season. Asparagus, peas, zucchini, and so many more. Even more wonderful is the warmer weather and the endless possibilties for weekend getaways. Milan may not be the prettiest Italian city, but its location is perfect for weekends at the seaside, in the mountains or day trips to one of the many nearby lakes. Thursday May 1st was a holiday here in Italy and we decided to make a long weekend out of it. Hubby and I took Friday off work and spent three fabulous days on the Ligurian seaside. 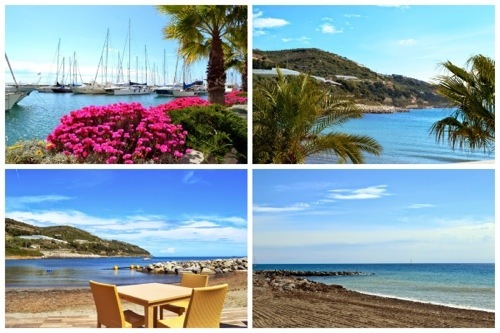 We stayed in a small town, called San Lorenzo al Mare, situated between the cities of Imperia and Sanremo. The small hillside town is cute, but nothing to rave about. To give you an idea of the scale, we asked for directions to the supermarket and the guy said “turn at the traffic lights…”, when we inquired “which traffic lights” he was referring to, his response “there’s only one”; one traffic light, one pharmacy, one supermarket. However, our hotel was located next to the marina and right on the beach, boasting beautiful views of both the sea and the hills above. 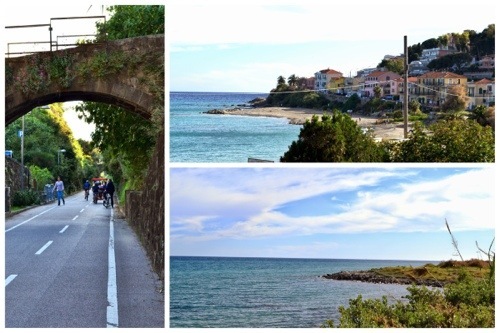 One of the main attractions in the area is a 24 KM bicycle path that starts in San Lorenzo al Mare and continues to Sanremo, along the seaside. Eventhough neither of us had been on a bike in years, and personally speaking I think I was 13 years old the last time I rode a bike that wasn’t stationary, we decided to rent some bikes and take advantage of the beautiful weather to get some exercise and fresh air and test out our newly acquired and first ever, DSLR camera. We’re still learning and granted National Geographic won’t be featuring our photographs anytime soon but we’re having a blast with this photography thing. Hubby wanted to go all the way to Sanremo, wishful thinking, we got 13 km down the bike path and decided to head back before our legs turned into silly putty. 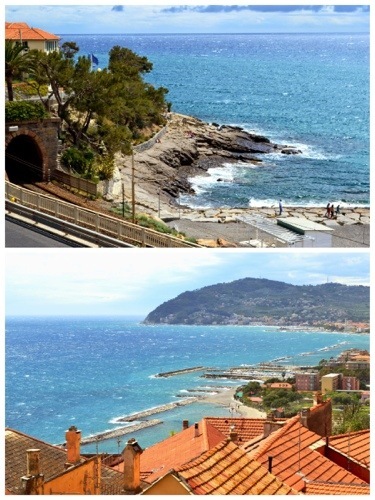 The next day, we visited the nearby town of Cervo, another hillside town with picturesque views of the Ligurian sea, and we had lunch by the beach, watching the waves crash into the rocks beneath us. 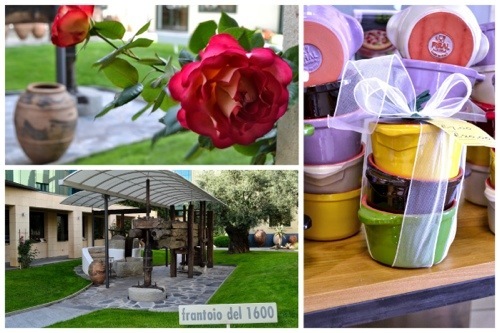 In the afternoon, we visited the Olive Museum and Emporium in Imperia to pick up some regional products, and these cute Terracotta pots that are super versatile and can be used in the oven or on the stovetop to make and serve anything you fancy. We wrapped up our second day relaxing in the hotel’s private spa. An oasis for two, with jacuzzi, hot water bed, sauna, eucalyptus steam room and rain shower. We were lucky enough to be the last couple to book the hour, and were given carte blanche to use the space for as long as we liked. Refreshed and rejuvenated, we started off our last day with a walk on the beach, soaking our feet in the salt water and then headed to Sanremo for lunch before finally making our way back to Milan in the early evening on Saturday. Back in Milan and back at work, I found myself home for lunch one day due to a lesson cancellation. 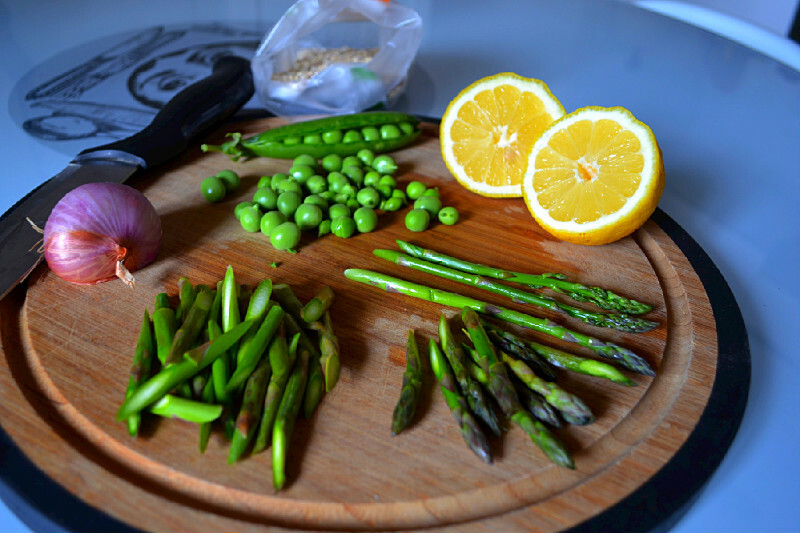 I opened the refrigerator and found some fresh asparagus, peas and lemons staring back at me, eager to be used. I could almost hear them shout “pick me, pick me”…ehemmmm vegetables don’t really speak to me…really…they don’t. 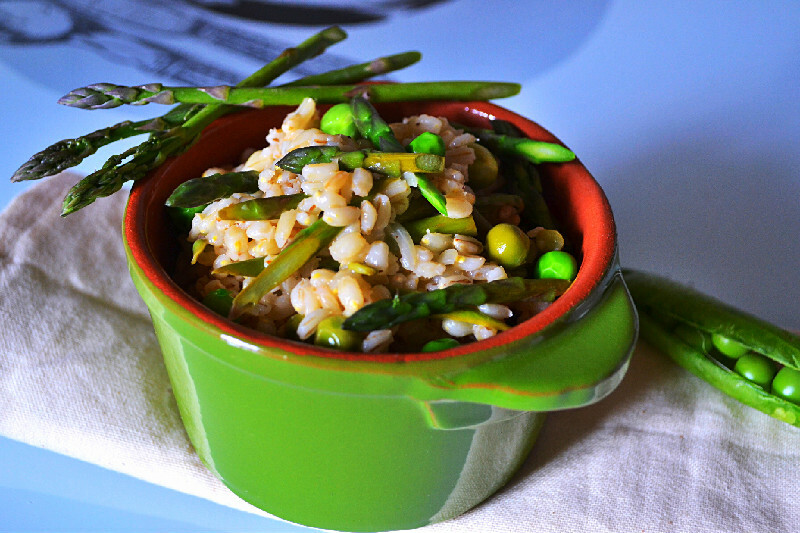 I on the other hand was eager to use and photograph the little Terracotta pots I picked up at the Olive Emporium, so I used one to serve myself this delicious Spring Barley with Asparagus, Peas and Lemon for lunch. Finely dice shallots. Wash and chop asparagus into 1 inch pieces, separating the tips from the stems. Remove peas from their pod. In small pot, bring water to a boil, add a pinch of salt, and blanch peas for about 5-7 minutes, remove and set aside. In the same pot/water, blanch sliced asparagus stems, remove and set aside. Then blanch the tips separately in the same pot/water, remove and set aside. Heat 1/2 tablespoon of extra virgin olive oil in a pan over medium heat (use water for oil free). Add diced shallot and a pinch of salt and sautee for 2-3 minutes. Add 1 clove of pressed/crushed garlic and sautee for another 2-3 minutes. Add barley, and mix well to combine with the onion and garlic mixture. Sautee for 2-3 minutes, slightly toasting the barley, then add 1 1/2 cups of water and bring to a gentle boil. Reduce heat to low, cover and simmer for approximately 25 – 30 minutes. 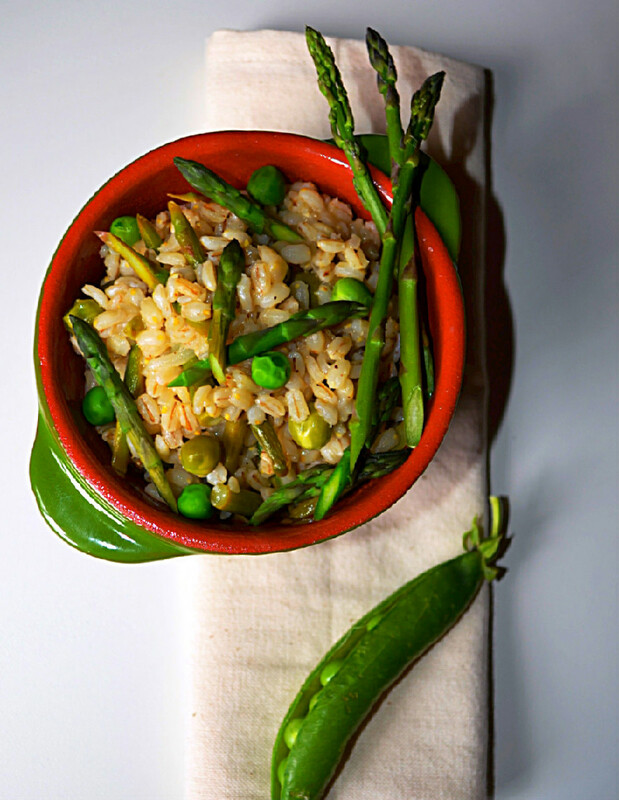 Once 25 minutes has elapsed, add blanched asparagus stems, peas (reserving a few for garnish), lemon juice, non dairy cream, salt and pepper to the barley mixture. Stir to combine and let simmer for about 5 – 10 minutes on low heat until flavours are combined, liquid has evaporated and barley is well cooked (it should be soft and chewy but still a bit firm and not mushy). Transfer to a serving bowl/dish (or cute little terracotta pot in my case), garnish with blanched asparagus tips and reserved blanched peas. Season with salt and pepper to taste.